Q1: Congratulations on winning the Inaugural Perrier-Jouët Arts Salon Prize. Could you share with us the nomination/selection process and your feeling of receiving the award? A: I was so thrilled to learn that I had won the Perrier-Jouet prize. Even being nominated for such a prestigious new award was an honour. The prize is wonderful in that consists not only of a generous cash award, but also travel to both France and Design Miami, which will broaden my horizons; I have never been to either France or America. And preparing for my first solo exhibition in such a wonderful setting as the St Pancras Renaissance Hotel is a dream come true. Q2: Your education and career spans between East & West. What made you decide to pursue your study and career in Europe? 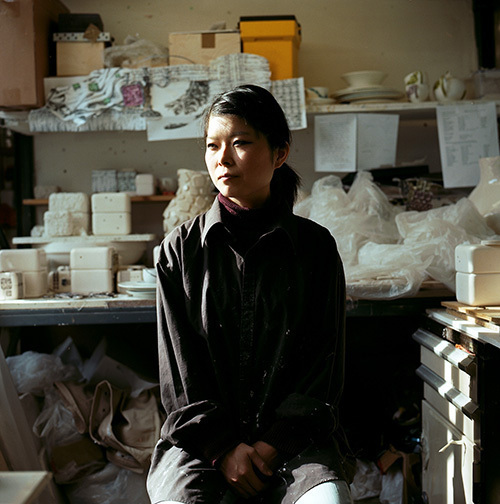 A: I was enjoying making ceramics in Japan but I became interested in Scandinavian design. That is the first reason to come to Europe. Also, I simply wanted to try to see what life and work was like outside of Japan. Q3: Your works are very different in Japan & in the UK, there seems to be a shift from the abstract yet colourful style to a more figurative but minimal style. What are the creative inspirations behind them respectively? 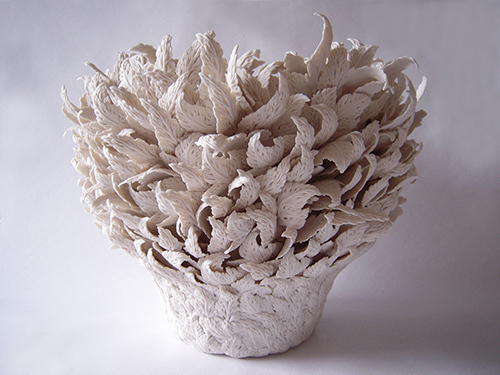 A: I use a technique initially inspired by Josiah Wedgwood’s Jasperware, in which thin ceramic reliefs or ‘sprigs’ are applied as surface decoration to a piece. 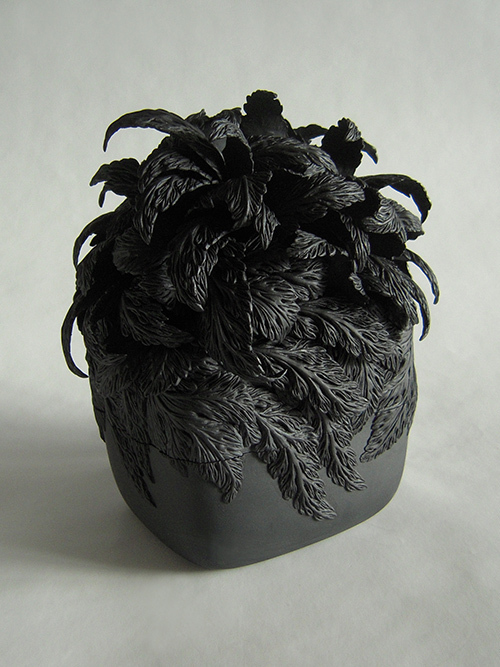 I wanted to make innovative pieces featuring the sprigging technique, but to move away from the traditional use of sprigs solely as ornament, and to attempt to work with ceramic sprigs in a new and sculptural way. 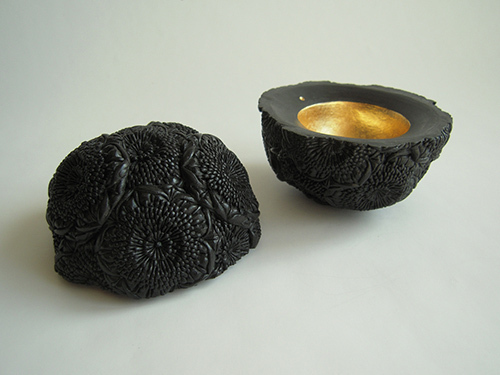 Extensive experimentation with different methods and clay bodies enabled me to create two new ways to use the sprigging technique. One was to cover the entire surface of a shape with sprigs; the other was to construct asculptural object solely out of many layers of sprigs. The subjects of my current work are shapes inspired by leaves and flowers. I study botanical forms in the garden. I find myself drawn to the intricacy of plants, examining the veins of a leaf, how its edges are shaped, the layering of a flower’s petals. I look, I touch, I draw. Q4: You have been living in London for some time. How do you feel about the city - what are the things you love most here and you don't miss at all when you are away? A: I like many kinds of cultures in London. In a one-minute walkfrom my studio, I can have very good Moroccan food, pastries from Portugal, pizza, Indian food. The thing I would miss least about London is being packed like sushi in the Tube at rush hour. Q5: What are your future plans after the St Pancras Chambers Club exhibition? A: I will engage with new and inspiring experiences, and pursue creative challenges within my craft. The more I look at the natural world, the more I have begun to feel the importance of the concept of flow in nature. I believe this is the heart of nature. From small, minute elements such as leaves to grand magnificent views, they are all in flow. Flow is what makes nature alive. In this sense, the flow seems to me to be confined to that small scale in my current work. What I would like to do is to make a whole form itself also become an element to express the active movement in nature. I would like to challenge it at a larger scale I have ever done. I believe the result will show the dynamic energy of nature and make my work more exciting and more true to the natural world. This aim will bring both technical and artistic challenges to my current working methods. 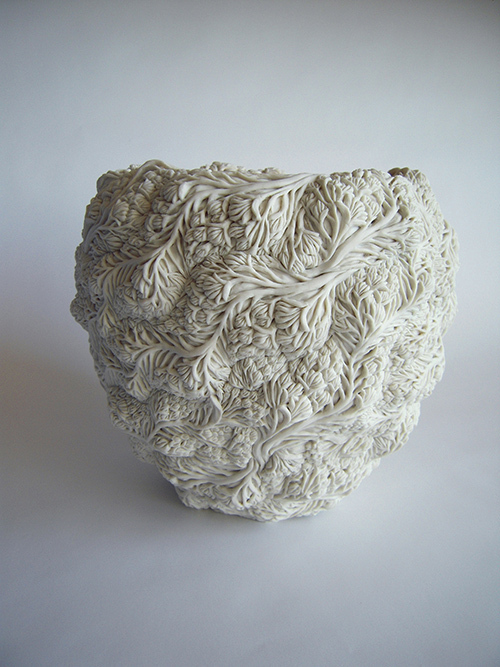 Conveying flow on both a small and a large scale means that I will need to develop my techniques further to enable complex constructions in porcelain by experiments and research. For the new work, I would also like to expand and widen my inspiration from nature beyond the familiar plants in my immediate environment. I intend to visit the collections, archives and libraries of botanical institutions like the Royal Horticultural Society and Kew Gardens to research extinct plants, or plants in countries I have never visited to see which of these will be most suitable to adapt into porcelain. I would like to concentrate deeply on this research and experiments taking enough time, possibly 3 -4 months.